Upcycling Projects: Turn Your Trash into Garden Treasures! Gardeners are a pretty thrifty bunch, and it’s in the garden where upcycling old items into new really comes into its own. From transforming tins into planters to repurposing old furniture for storing produce, there are countless ways to put otherwise unwanted items to good use in the garden. Read on or watch our video to discover some of our favourite garden trash to treasure ideas. Plant pots are a great place to start. 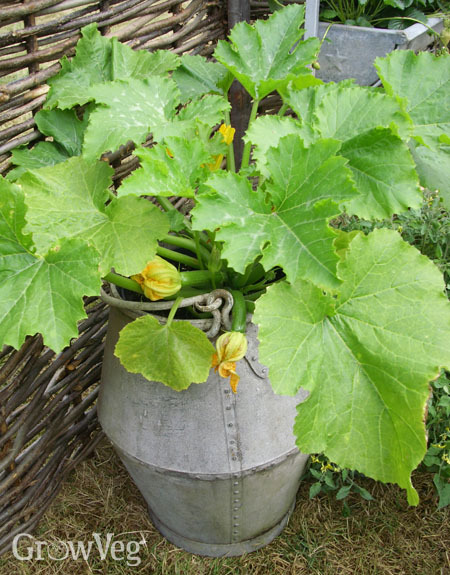 From the truly enormous, such as old galvanized water tanks, to something a little more modest (think old tin cans and worn-out wellingtons), there’s a whole universe of household and garden items that make excellent upcycled garden planters, many of them quirky to say the least! Potential containers will need sufficient drainage holes in the bottom so excess water can drain out. Drill some if necessary. You’ll also need to consider the depth of the container. An old cattle trough makes an excellent raised bed for just about any vegetables, while a length of guttering is best saved for shallow rooters like salads or strawberries. Almost anything can be turned into a container for growing plants! Reclaimed bricks and paving are perfect for adding a lived-in feel to your garden. Lay bricks to make hardwearing paths or patios, using a stretcher-bond or basket-weave pattern to stunning effect. Paving slabs can be positioned between beds for quick and easy access. Or turn slabs or slates on their side to create a solid edging to raised beds. Stack up bricks, stones or rocks and top with offcuts of wood to make an attractive place to rest your feet. Perhaps to admire a sculptural masterpiece made from salvaged materials! Or use old bricks or edging to create the outline to a beautiful herb wheel such as the one below. Keep crops safe in the cooler months with your own home-made cold frame. At its simplest, this can be a polycarbonate sheet screwed to a wooden frame with a hinge at the rear for access and ventilation. Vining crops such as beans look stunning climbing up a thrifty arch made using plastic water or gas pipe (it may need to be stabilised with wood or metal stakes). And while we all know plastic-covered tunnels can be made using water pipe, how about making a framework for your crop protection from whippy prunings? Or try flexing offcuts into highly attractive supports for both ornamentals and crops such as peas. Birds such as pigeons can be a pesky nuisance in the vegetable garden. Tie old CDs onto string and suspended them above crops to unnerve birds as they move in the wind. Silver tape attached to canes will have a similar effect. Or string out coloured tape over vulnerable crops such as brassicas. And, of course, the classic scarecrow offers the perfect opportunity to get creative with your recycling. Move it to a new position occasionally so the birds don’t get too used to it. Let your imagination go wild and make a scarecrow out of junk! We also want to attract wildlife into the garden. Old chipped pots, bricks, and various offcuts of wood can all be used along with straw, twigs and cones to create cosy homes for beneficial bugs such as ground beetles and solitary or mason bees. Stack them, stuff them or build them up into handsome structures worthy of even the smartest garden. Even a small pond will help draw in slug-hungry frogs or toads. For instance, place a layer of pebbles in the base of an old washing-up bowl, then add some larger rocks so that animals can easily get into and out of the water. Aquatic plants give the finishing touch to this watery habitat. 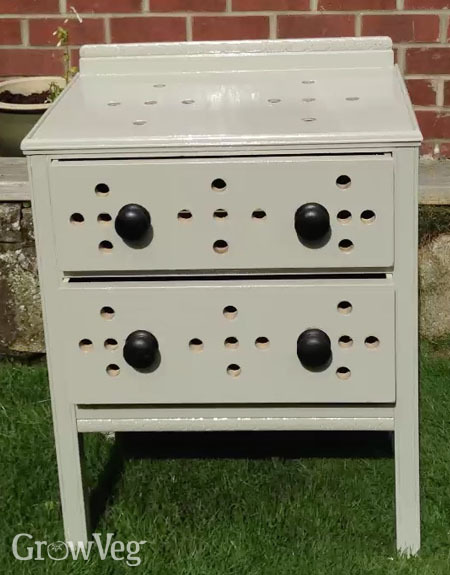 Old furniture can often be turned to excellent use in the garden. The old chest of drawers below has become a beautiful apple store with the simple addition of holes for airflow. Circles about an inch, or two centimeters in diameter were drawn at regular intervals over the unit then cut out using a hole saw drill bit. Shaded, well-aired and dry, apples should keep for far longer like this. Pallets offer a ready source of wood, but check the pallet stamp before using. This should show the IPPC or EPAL logo, plus the letters HT, which indicates that the wood has been heat-treated and that there’s no risk of contamination from toxic pesticides. Pallets are perfect for transforming into structures such as compost bins. You can make a single bin, or one with two bays – a bay for maturing compost and one for adding to. Or upend a pallet, add a splash of colour and turn it into a beautiful vertical planter. Making raised beds is a great opportunity to reuse old wood. Join them together at the corners with screws, brackets, or hinges. They look great and offer many benefits to plants such as better drainage and an earlier start to the growing season. If you’re lucky enough to live by the sea, look out for driftwood, which can be used to make a truly individual rustic fence. Reusing old materials in the garden is a really great way to do more with less. I’m sure you’ve got lots of ideas as well – and we’d love to hear them! Please share them in the comments section below. "Hi I have just made a couple of compost bins from seven pallets. Don't muck around with screwing in brackets and the like, just use cable ties. Join two together to get the length. Easy peasy, done in 30 mins! Lynda"
"Cable ties are fantastic for so many projects!"